Chicken is beloved around the globe, but in Korea, extra effort is made to avoid wasting any part of it. Along with the neck and gizzards, Korean cuisine makes good use of the feet. Chicken feet, or “dakbal” in Korean, are widely eaten with alcohol. Their appearance alone can be a considerable challenge, with little effort made to disguise what they are. A typical serving consists of a pile of feet chopped off at the ankle. Dakbal are usually broiled in spicy red sauce, although they are sometimes grilled directly over the fire. Some people swear by dakbal for their collagen-rich skin, believing that chewing on chicken feet will do wonders for their complexion. Wearing disposable plastic gloves is recommended to avoid staining your fingers with the fiery red sauce, as you hold the foot in your hand and gnaw it away. It can be difficult to separate skin from bone. One tip from a veteran eater is to chew the whole foot at once, then spit out the tiny bones into a separate bowl. 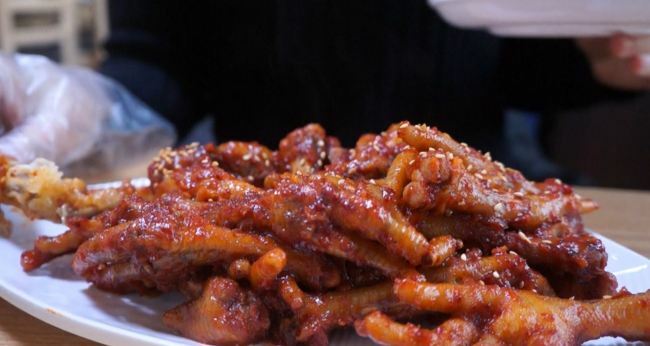 As many Koreans prefer tongue-numbing spiciness, chicken feet are often very hot. Koreans describe the dish as “burning the tongue off” and drink sweet beverages or eat seasoned rice balls to tame the heat. Some food companies have recently released packaged dakbal to enjoy at home. Precooked, the dish is warmed up via microwave or in a pan for five to 10 minutes. Restaurantgoers can also order dakbal without the bones and the talons removed, making it much easier to eat. But for an authentic experience, nothing beats chewing on squiggly chicken feet and spitting out the bones.